This article examines the constitutive role of mediated visibility in the emergence of contemporary vigilante initiatives. Here, visibility is conceptualized as a “heuristic device” to understand social phenomena, as well as a lever for organizations to acquire various forms of capital. 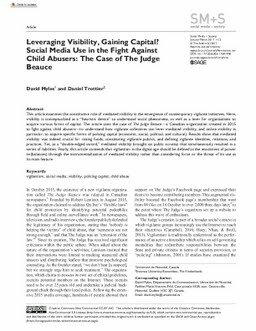 The article uses the case of The Judge Beauce—a Canadian organization created in 2015 to fight against child abusers—to understand how vigilante collectives can lever mediated visibility, and online visibility in particular, to acquire specific forms of policing capital (economic, social, political, and cultural). Results show that mediated visibility was indeed crucial for raising funds, constituting vigilant/e publics, and defining vigilante identities, relations, and practices. Yet, as a “double-edged sword,” mediated visibility brought on public scrutiny that simultaneously resulted in a series of liabilities. Finally, this article contends that vigilantism in the digital age should be defined as the enactment of power im(balances) through the instrumentalization of mediated visibility rather than considering force or the threat of its use as its main feature.